Gumdrops, lollipops, chocolate squares, jelly bears, and peppermint candies. The sky is the limit as far as decorating your own gingerbread house. They are a ton of fun to decorate, but first, you need to make the house itself. You can put it together fast from graham crackers and store-bought icing, or you can make it slowly, cutting in shapes according to a pattern or patted into a special gingerbread house mold. Those quick treats need to be eaten soon before they fall apart, but old-fashioned gingerbread houses are a tradition that can last through the holidays. Whatever way you pick to enjoy this yummy craft, know that your gingerbread has a spicy and delicious history. When the Crusaders came back from the Middle East, they brought wondrous spices that clever cooks of churches and wealthy families turned into amazing recipes for celebrations. An early European gingerbread was a mix of ground almonds, stale breadcrumbs, rosewater, sugar, and, of course, ginger. They pressed this paste into pretty molds. The finished cookie might be decorated with edible gold paint! As time went on, spices became less expensive. Soon everyone could enjoy a treat of gingerbread, whether baked stiff for cookies or served as a simple cake with a warm vanilla sauce. Gingerbread was especially popular in colonial America. Mary Washington, George Washington's mother, was said to have served her special gingerbread to her son's friend, General Lafayette, at her home in Fredericksburg. The Annual Gingerbread House Contest and Exhibit at George Washington's Ferry Farm is a sweet holiday tradition. If you are new to gingerbread houses but would like to try to create your own, the library has some books and step-by-step videos that should make constructing these fun and edible crafts a piece of cake—ginger cake, that is. Gingerbread Houses, Animals and Decorations by Joanna Farrow. Gingerbread Wonderland: 30 Magical Houses, Cookies & Cakes by Mima Sinclair. Turn your kitchen into a magical winter world with 30 ideas ranging from cute gingerbread families and their gingerbread streets to a delicious chocolate birdhouse and an edible star wreath. It's a Gingerbread House: Bake It! Build It! Eat It! by Vera B. Williams. Let Grandpa Ben teach all you need to know about making, baking, and building a gingerbread house. His clear instructions unlock the secrets of a delicious holiday tradition for young and old alike. Featuring dozens of recipes, this little book contains everything you ever wanted to know about the holiday goodness of gingerbread. Making Great Gingerbread Houses: Delicious Designs From Cabins to Castles, From Lighthouses to Tree Houses by Aaron Morgan, Paige Gilchrist. "If building a gingerbread house has long been on your Christmas wish list, this is the year to pull out the mixing bowls and rolling pin and begin. The book starts with the basics of house building -- complete, easy-to-follow instructions and how-to photography for baking, designing, assembling, and decorating. Then comes an unruly settlement of 40 diverse houses to build. There are even a few non-Christmas surprises: a gingerbread birdhouse, a carousel, and a haunted Halloween house." Making Gingerbread Houses by Rhonda Massingham. Provides step-by-step instructions for no-bake gingerbread houses which are easy to prepare and assemble—not just winter designs. Also available as an eBook. 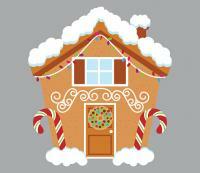 A Year of Gingerbread Houses: Making & Decorating Gingerbread Houses for All Seasons by Kristine Samuell. 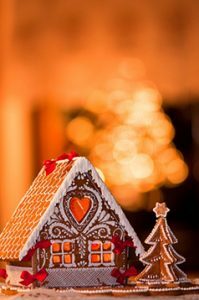 With designs for Christmas, Halloween, Valentine's Day, and birthdays, these exquisite projects include a cottage, chalet, and two-story house. Options as customized windows, doors, chimneys, paths, trees, topiaries, and even lighting add to the charm. More than 200 helpful step-by-step process shots; informative sections on tools, techniques, and components; and patterns, piping templates, and tips on baking, assembling, and troubleshooting assure magical results. 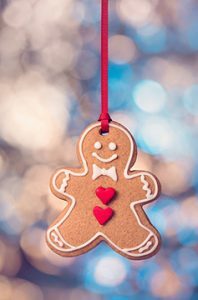 Follow the history of gingerbread, from its origins in the medieval crusades to country fairs to today's holiday treats. Includes both historic and modern recipes. A craft project to go with the Jan Brett's book, The Gingerbread Baby. No cooking (but, alas, no eating) with this house. A quick and easy holiday decoration. Necco wafers, the candy that's 150 years young, makes a beautiful roof on a gingerbread house. The bakers at Necco have teamed up to create directions for a classic construction. No patterns or templates here, but measurements are included. Necco recommends baking the house pieces a day or two in advance (possibly weeks! This tough gingerbread freezes well). It's no fun to have walls of hot gingerbread caving in at the construction site. This recipe also works well with gingerbread house molds.